HP Umpire Nic Lentz ejected Pirates Manager Clint Hurdle (out of base path call) in the top of the 1st inning of the Pirates-Braves game. With two out and two on (R1, R3), Pirates batter John Jaso hit a 1-2 knuckleball from Braves pitcher RA Dickey on the ground to catcher Kurt Suzuki, who attempted to tag Pirates baserunner R3 Josh Bell for the inning's third out. Replays indicate that in attempting to avoid Suzuki's tag, Bell ran more than three feet away from his base path, the call was correct. * At the time of the ejection, the Pirates were leading, 1-0. The Braves ultimately won the contest, 6-5. *Rule 5.09(b)(1) states that "Any runner is out when—He runs more than three feet away from his base path to avoid being tagged unless his action is to avoid interference with a fielder fielding a batted ball. A runner’s base path is established when the tag attempt occurs and is a straight line from the runner to the base he is attempting to reach safely." This is Nic Lentz (59)'s second ejection of the 2017 MLB regular season. Nic Lentz now has 10 points in the UEFL Standings (5 Previous + 3 AAA + 2 Correct Call = 10). Crew Chief Tom Hallion now has 3 points in Crew Division (2 Previous + 1 Correct Call = 3). This is the 47th ejection report of 2017. This is the 25th Manager ejection of 2017. This is Pittsburgh's 3rd ejection of 2017, T-1st in the NL Central (PIT, STL 3; MIL 1; CHC, CIN 0). 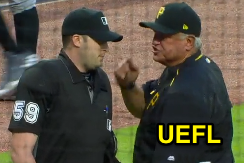 This is Clint Hurdle's 2nd ejection of 2017, 1st since May 22 (Phil Cuzzi; QOC = N [Balls/Strikes]). This is Nic Lentz's 2nd ejection of 2017, 1st since May 19 (Mike Matheny; QOC = Y [Balls/Strikes]). Wrap: Pittsburgh Pirates vs. Atlanta Braves, 5/23/17 | Videos via "Read More"